I've made this point before in several blog posts, but it bears repeating until Ancestry.com does something about it. 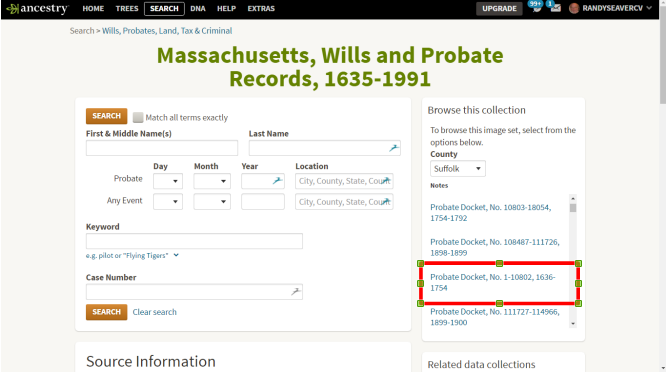 You Should Browse Probate Records on Ancestry.com - Don't Rely Only on Their Index! Why? Because they indexed only some of the different volumes in each state and county. Yes - use the index but be skeptical when you find only one record or no records. In EVERY case, review the Probate Index to find all of the available records. Here is my latest example: I transcribed a will in Amanuensis Monday - Post 320: Will of Henry Smith (1680-1743) of Medfield, Mass. posted on 16 May 2016. 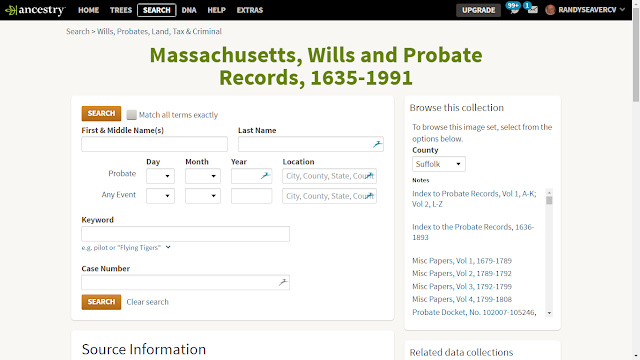 I found the will by using the Ancestry.com index - they had indexed some of the Suffolk county, Massachusetts probate records. Yesterday, I went searching for "the rest of the records" for Henry Smith that are usually found in Massachusetts probate packets - an inventory, a distribution, an account, warrants, receipts, etc. 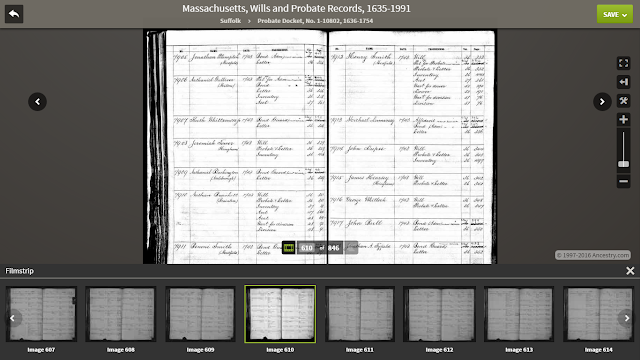 The list of the different "record books" digitized by FamilySearch opens, and a researcher can pick one of them to browse. Sometimes the list of "record books" doesn't open and the user has to select the County again. 2) I want an Index to probate records for 1743 for Henry Smith, so I clicked on the "Index to the Probate Records, 1636-1893" record book. The first image for this "record book" opened, and I could see that it was from FHL microfilm 496,888. There are 701 images for this record book. Alternatively, I could have used the filmstrip to advance 8 images at a time forward and backward, or used the left or right arrows to advance one image at a time. The line for Henry Smith for 1743 says there is a Will and it is Case No. 7912. 3) I need to find the contents of Case 7912. Back to the Massachusetts Wills and Probate Records database page, I searched down the list of "record books" to find another "record book" that contains Case 7912. I found the record book for "Probate Docket, No. 1-10802, 1636-1754." Docket Number 7912 is included between Number 1 and Number 10802. Note that these Probate Docket books are not in numerical order, they are in alphabetical order. * Division - Volume 51, Page 76. I note that only the first item - the Will - was indexed by Ancestry.com. If I relied solely on the index, I would not know about the other papers in Henry Smith's probate file. 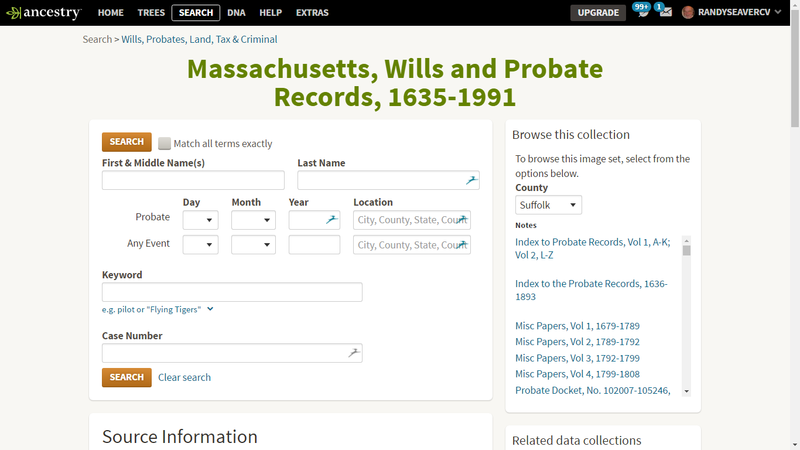 * Go back to the Massachusetts, Wills and Probate Records database page and find each of those Volumes in the list of "record books." * In each Volume, find the page numbers and ensure that the record you seek is on the page image. 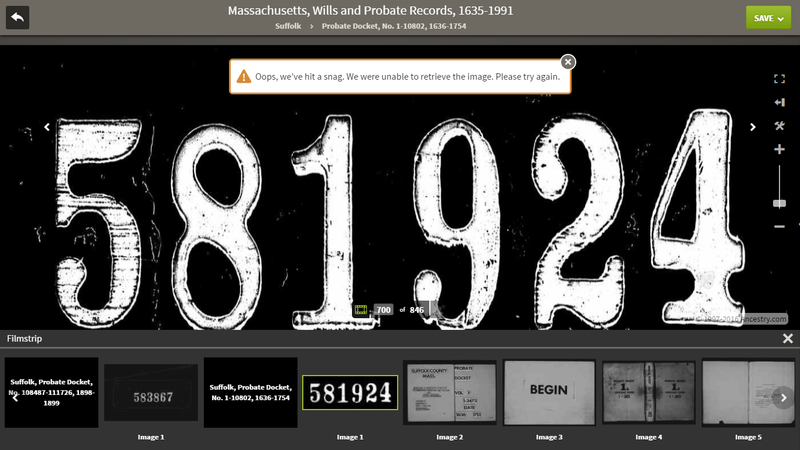 Check adjacent images for continuation of the record. * For each image, download it my computer by clicking on the green "Save" button and then "Save to your computer" - on my computer it saves to the "Download" file folder in Windows 7. * Open the "Downloads" file folder and rename the file using my file naming convention. * Move the specific file from the "Downloads" file folder to my Surname > Family > Documents file folder for the specific family. This way I can find the file easily. 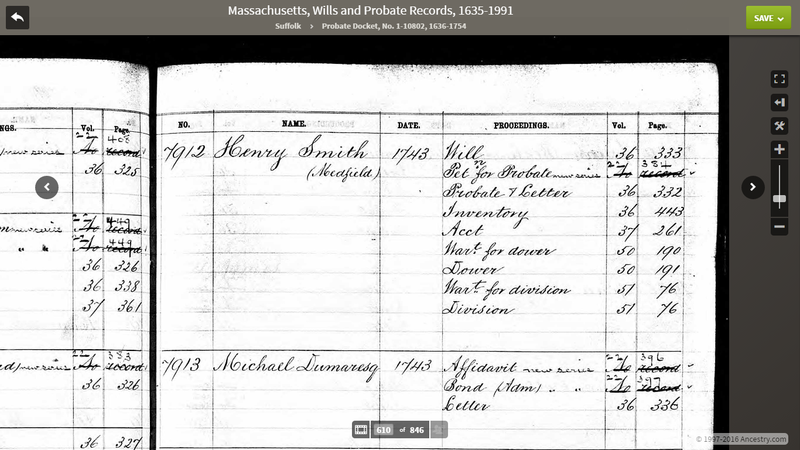 I was able to find all of the records for Henry Smith listed above, except for the "Petition for Probate." I saved them to my computer, renamed them, and moved them to my file folder for Henry Smith's documents. I had a surprise - the inventory showed that Henry Smith had a significant inventory. Another surprise was that the dower was not set off, and the division of property to the heirs, was not done until 1755. 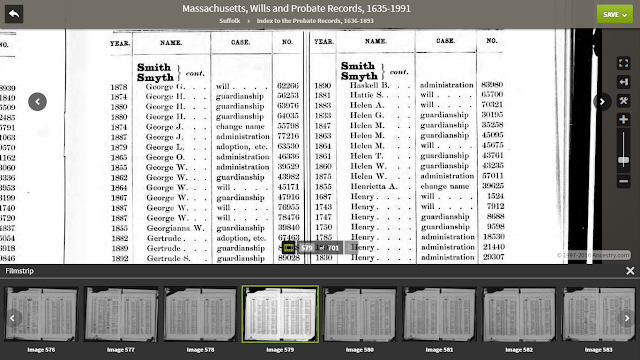 I will transcribe some of them because they are very typical of mid-18th century Massachusetts probate records. 7) These Henry Smith Probate File 7912 papers are from the Suffolk County Probate Court clerk volumes - the court clerk copied the original papers submitted to the court into these court clerk volumes. The original papers were folded and put into a Probate Court Packet in a legal-sized envelope with the name and file number on it and then stored in the Probate Court archives. Unfortunately, not every Massachusetts probate court has had their Probate Court Packets microfilmed - some have and some have not. Suffolk County Packets were not microfilmed and therefore are not included in the Ancestry.com digitized database. A researcher has to go to the Suffolk County Probate Court and try to access the specific Probate Packet, copy the pages, etc. 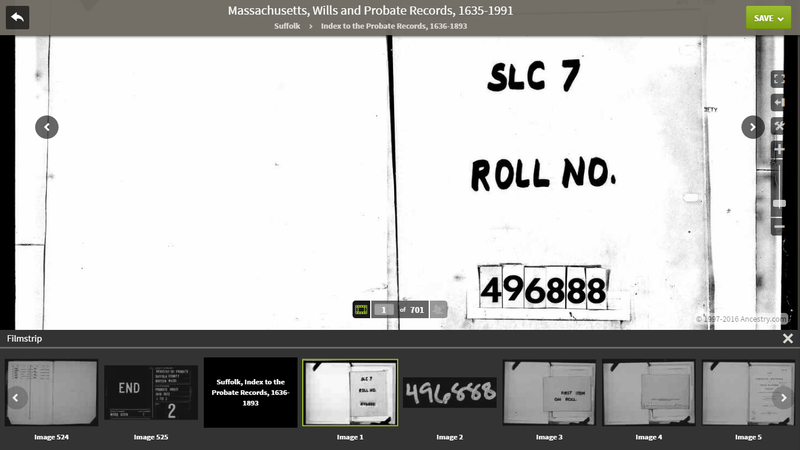 The process described above is what researchers have performed for Suffolk County, Massachusetts probate records using FamilySearch microfilms for decades. It's just easier now since the records were digitized and then partially indexed and are available online on demand, rather than going to Salt Lake City or ordering FHL microfilms at an FHC. 8) While I did this for Massachusetts, the process for all of the other states is similar. Some of the terms change, the names of the record books may be different, but the process of browsing to find probate records is very similar for every state. 9) I realize that I may be preaching to the choir here, but all researchers need to be aware of the limitations of the Ancestry.com indexing for state probate records, and of the process to find the "rest of the records" as noted above which may contain significant genealogical and family history content. Once you've mastered the process, the rewards are tremendous. This is a useful cautionary note. Also, Ancestry's indexing is frequently wrong as to dates and subjects. The indexer(s) seem only to have had "Probate Date" in their vocabulary, and often states the date a will was signed was the date of probate. Other estate documents are called "probate" records and often have wrong dates attached to them: petitions for partition, inventories and appraisements, acountings, etc. may be called "Probate" documents. The researcher seeking accuracy should definitely look at the documents to determine their natures and correct dates.